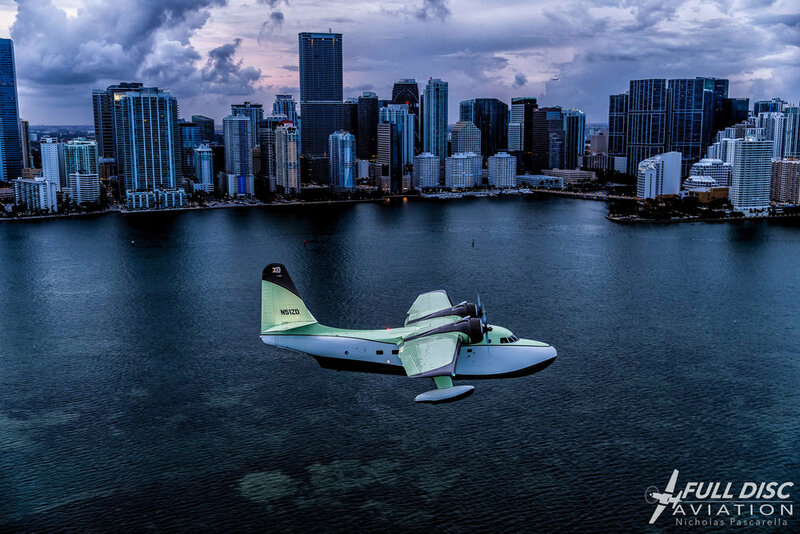 Recently, I was given the opportunity to shadow the "Flying Boat" documentary film crew as they traveled to the Bahamas to capture a mint green Grumman Albatross G-111 in its natural habitat; that is, anywhere with water and adventure. I first worked with Flying Boat director Dirk Braun on Candlewood Lake last year as his crew filmed a silver Albatross against the dark green foliage of New England. 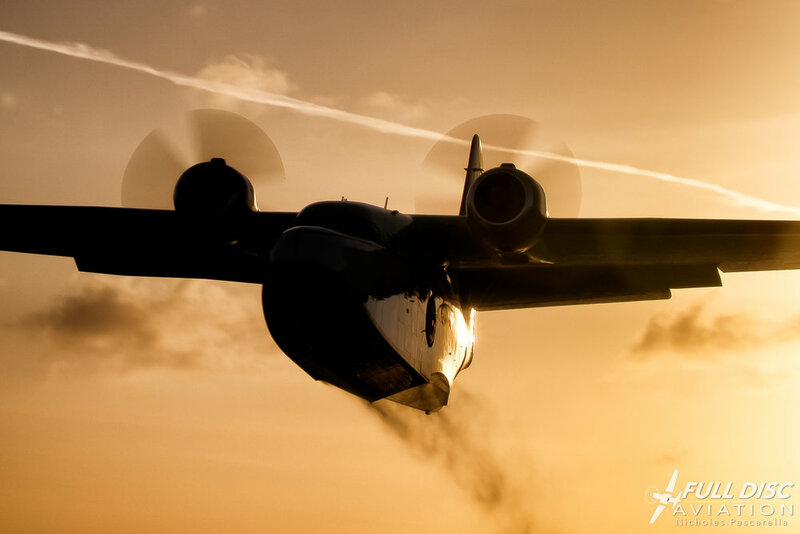 The shoot was dream-like; sunrise touch and gos on the water and Albatross surfing, as Dirk carved up the wake created by the aircraft taxiing across the lake. With this in mind, when Dirk told me about this trip to the Bahamas, my imagination spun ideas like a storm cloud dropping tornadoes. 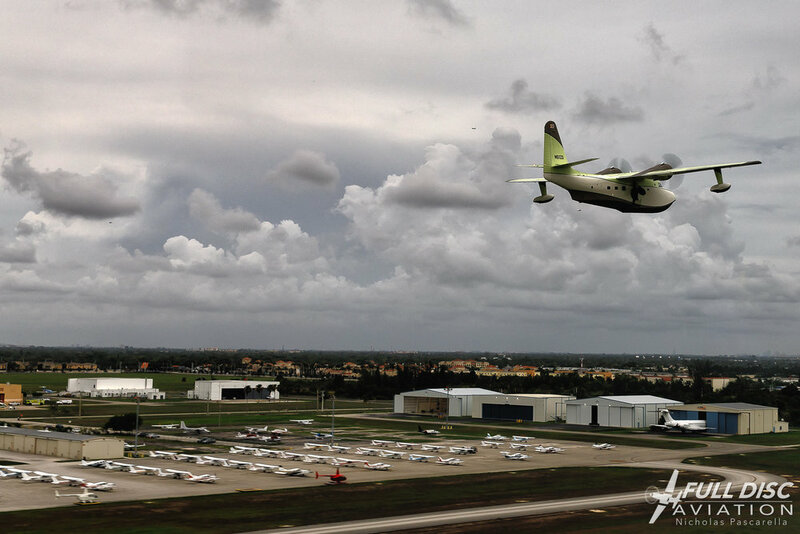 Our first stop was Miami Executive Airport. I arrived before the rest of the crew and got to sit in on the first flight briefing of the trip, sitting around maps and discussing topography of southern Florida with the pilots. That evening before we left for the Bahamas, I rode with Dirk in the back seat of a TwinStar AS355 helicopter for an air-to-air formation flight with the beauty aircraft, with our pilot and a cinematographer working together to film from a stabilized camera mounted on the nose of the helicopter. Due to technical issues we were forced to abort our takeoff shoot and aggressively circle back to the helipad, which was gravely concerning for everyone filming and flying. We were delayed for a few minutes but eventually got the situation resolved and filmed takeoff once more, following the Albatross down the runway and into the air. We slid into formation together and flew a route that would take us along the shores of Miami's famed South Beach in evening light, doing touch and go's on the green water under cloudy skies and, thanks to the earlier delay, landing as the clouds parted to reveal a brilliant, ephemeral orange-purple sunset behind the descending flying boat. The light faded entirely just after touchdown. It was a sweet taste of fortunes to come. Bright and early the next morning, we filmed takeoff once again at Miami Executive Airport and flew to Andros, Bahamas, where we took on fuel. The flight took us over the southernmost bits of Florida and the wild landscape of the Keys to the deeper blue of the Atlantic Ocean. We covered many miles of deep blue against puffy clouds in even lighting before the water color started varying widely with the depth of the water and the sandscape beneath it. 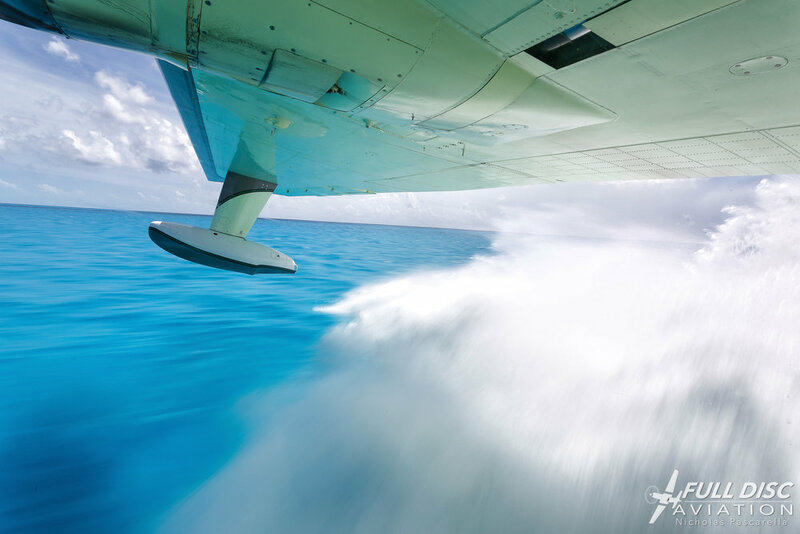 The flight was conducted at low level, occasionally the lowest, as the Albatross did touch and go's in daphne blue channels flowing down the center of uninhabited islands. 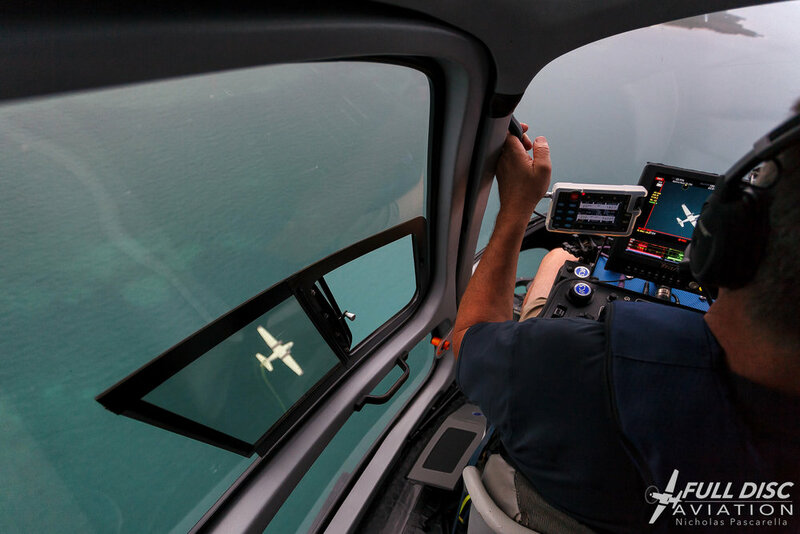 To film these epic scenes, our skilled pilot would occasionally have our helicopter crabbing sideways at 70mph no more than 30 feet off the ground as we filmed the Albatross lifting off the water alongside. 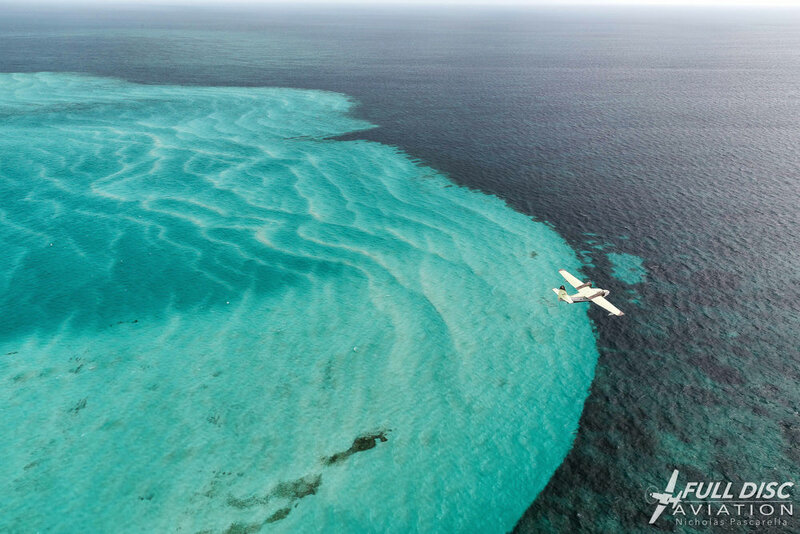 We skirted the edge of reefs, banked over long shapes of sharks and circled plane wrecks from years past. At one point, Dirk looked over at me and, because of the lack of communications in my headset, motioned with his hands for me to breathe. I did just that as we fell back from the Albatross for a spell, our pilot flying the helicopter with his knees as he peeled back the wrapper on a granola bar. 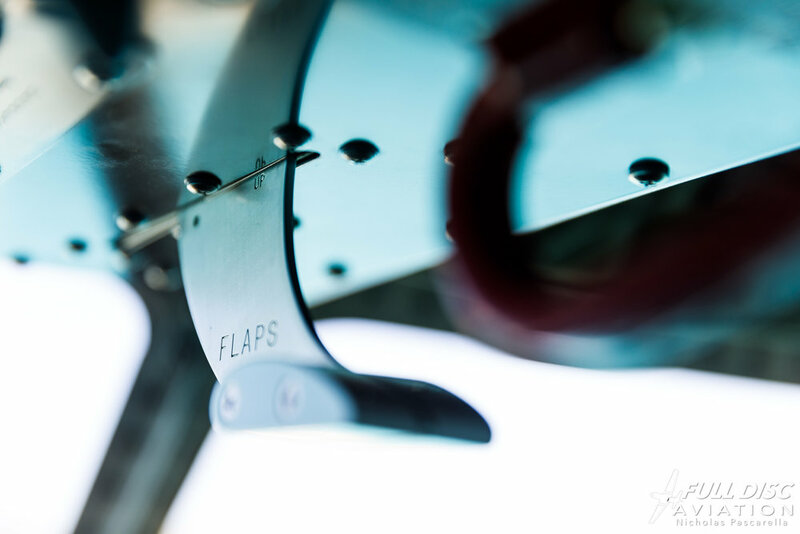 I set my cameras in my lap and ruminated for a few short minutes, absorbing the Albatross' iconic shape against the greenblue of the water as our chopper blades pounded the air above me. If aviation is a religion, this was church. 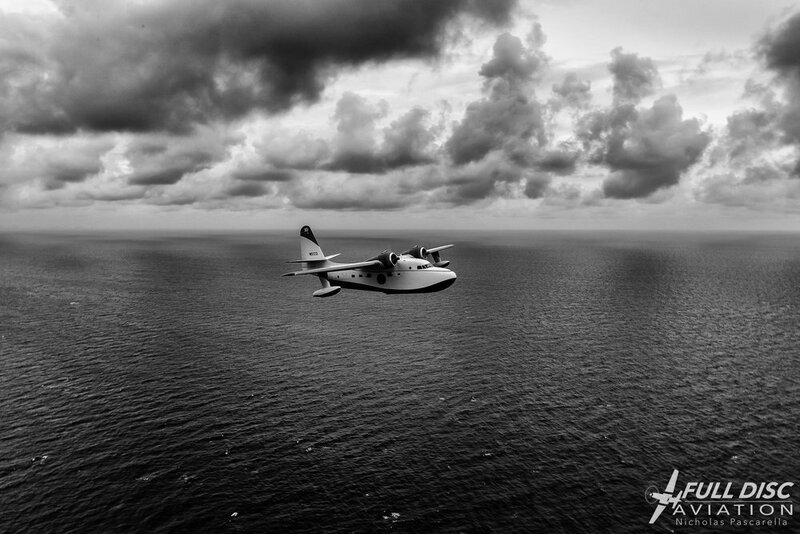 Once on the ground in Andros, the director and I transferred to the Albatross for the next leg of our journey as the helicopter returned to US soil. 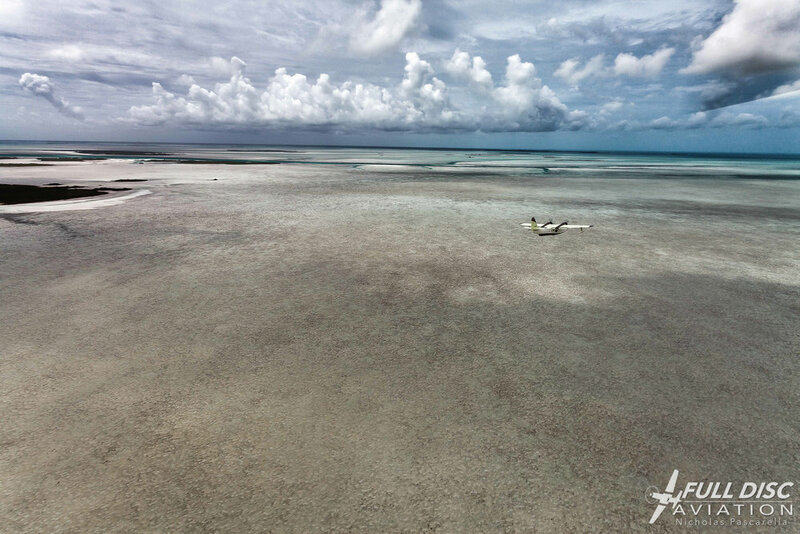 After a short flight over deserted islands, we landed on a sandy colored runway in George Town, Bahamas, to refuel the aircraft for the upcoming week. Here, I got my first taste of the island's mystical charm when the fuel truck driver pointed at the sun and told me the next few days would be hazy and rainy. He was spot on. With everyone on board and the tail stand stowed, the Albatross coughed back to life and we taxied to the end of the only runway. Takeoff was loud but tremendously satisfying; sitting in the cabin just behind the flight deck also afforded a close look at the unique landing gear through the portholes as the wheels retracted into the sides of the fuselage where they would stay for the next week. The Albatross pilot's friends joined for this leg of the journey, flying loose formation in a red Robinson R44 helicopter and a bright yellow Carbon Cub on floats. The crew enjoyed the chopping growl of the Wright Cyclone 9-cylinder radials as early luxury travelers would have, watching miles of undulating blue gradient roll beneath us and picking out rays and sharks as our shadow raced across sandbars. We splashed down in a sheltered cove on the leeward side of Long Island, Bahamas, surrounded by spiny island vegetation and jagged rocky beaches where the red Robinson landed. 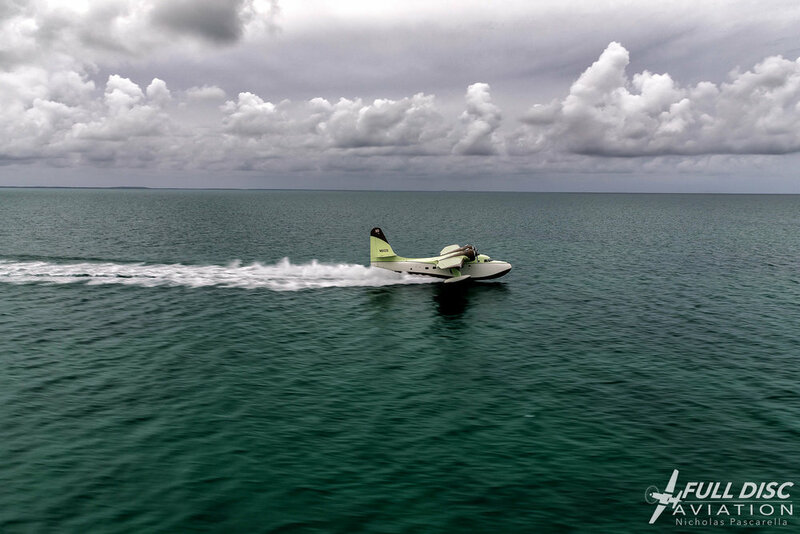 For a week, the Flying Boat crew spent long hours baking under the equatorial sun using a myriad of cameras to capture the flying boat in all its glory, floating at anchor in the turquoise waters off the beach. The Long Island scene was appropriate for this film in that many of the locations used for filming were completely untouched by humans. Even the sandy beaches were found to be free of human footprints. Thematically, the spirit of fantasy underpins the "Flying Boat" film, while the art-deco style of the pioneering traveler saturates the aesthetic, and on an island with 800 human inhabitants that is a four hour's drive tip to tip, pioneering felt like an appropriate word for the filming. We were supported by two yachts and their crews, and their assistance occasionally became production-saving with transportation to and from our remote beach, and food and water when there was none to be had. Once on location, it wasn't unusual for stingrays, manta rays, sharks and shimmering schools of fish to swim through "camp" as the crew often filmed in knee-deep water or from a small support boat. The crew erected a makeshift tent with dead branches, bed sheets and zip-ties to protect equipment and personnel from overheating, as things like my lens filter case were melting in the sun. But this sun shelter attracted attention from wildlife, as curious crabs and lizards routinely found themselves feeling out my camera cases in the shade. Wherever I set my camera down on the rocks, it was always nestled between snails. The crew was dynamic and highly skilled, coming from all across the US. Connor Cassidy (camera operator), Petr Hejl and Mike Gearin (operating the drones) and I were familiar with one another already, having worked on the Candlewood Lake shoot together. New to me was Will Atherton, director of photography and Chris Eckrich, our production assistant. From the west coast, Mikel Cook worked the underwater cameras. The crew established a rapport with one another the way a sports team would, as cooperation was key in pulling off this shoot. Everyone was working with the finest equipment with the necessary skills to utilize each camera to its full potential. With that said, our film mission and the vehicles for capturing Dirk's vision contrasted sharply with the island and its infrastructure. Electricity for the entire island is powered by three diesel generators. Grocery stores are nearly non existent. The mosquitoes are relentless. Planning trips with any of the resident boat captains, we quickly realized "island time" meant "late to never," occasionally putting the crew and all of our equipment in tough situations. The restaurants are few and far between on the island, but one important note is that nearly all of them that we visited served conch fritters: delicious. 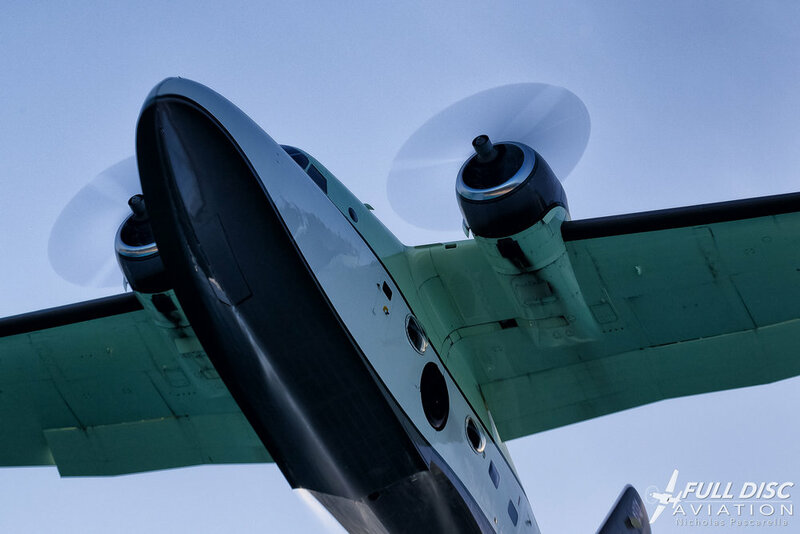 Logistics with many moving parts involving lots of heavy equipment became a highly challenging endeavour but persistence paid off and the crew achieved remarkable success in filming some of the most spectacular aviation footage I've ever seen. The weeklong shoot was capped by a surfing scene and a sunset water takeoff/landing in the best light the crew had all week. Just like the Candlewood Lake shoot but on different color water, Dirk surfed behind the Albatross as the pilots executed taxi passes back and forth in front of our remote beach, the crew filming from overhead, underwater, and from a chase boat. As the sun set, we briefed the final scene standing around one of the support boats as gentle waves lapped around our ankles. We got into position as the pilots fired up the Cyclones one by one on the Albatross. 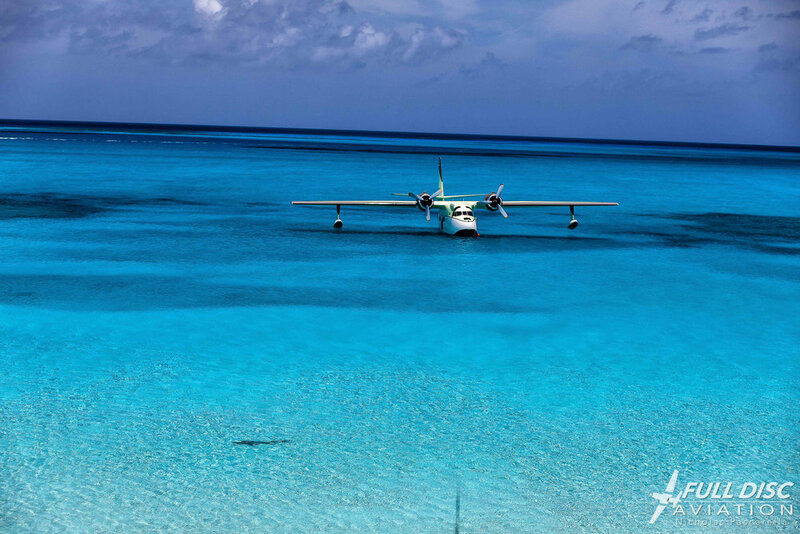 There was an electric feeling on the beach as the pilots pulled up anchor, taxied out, and took off directly at the beach towards the crew. "It's gunna get loud," Dirk smiled. Still trailing Caribbean water, the Albatross roared 20 feet overhead in a moment I can only describe as aviation ecstasy. A fine mist settled on the beach as the sound of the radials throbbed behind our field of view and we tensed for the return pass, not knowing where she would pop out. One of the crew was standing on the rocky overhang looking out above the trees behind our beach and yelled out a warning as the Albatross came blasting over the beach at low level again. The pilots took her in a wide circle and landed facing us, directly inline with the setting sun. The bird reared back once on the surface of the water producing a massive wake as she slowed. From the mist surrounding her, she emerged perpendicular to us as the pilots turned her around and taxied back out for another round. 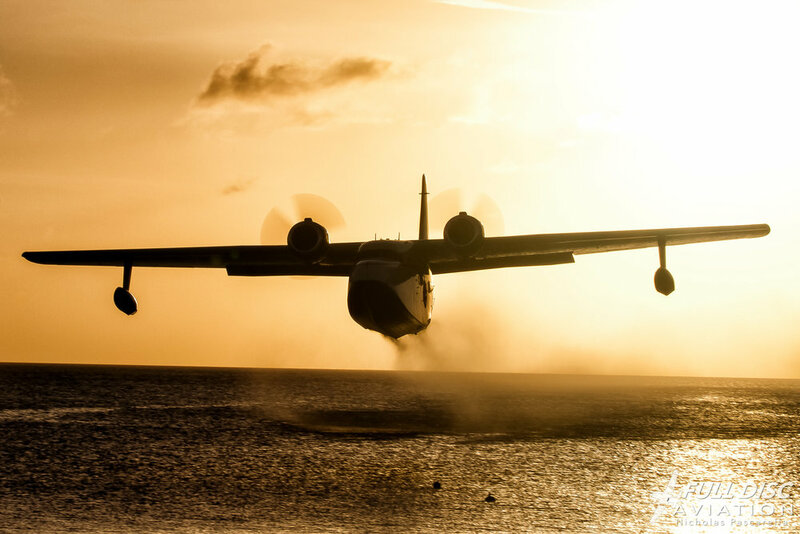 The second takeoff was even more spectacular; the pilots inching the aircraft even closer to the crew on the beach on takeoff, the Cyclones blasting a symphony of vintage melody. When the pilots flew back over our heads the second time, the bird was still trailing water. They weaved her into the sun this time, the light getting better and redder as the sun sank into the horizon. 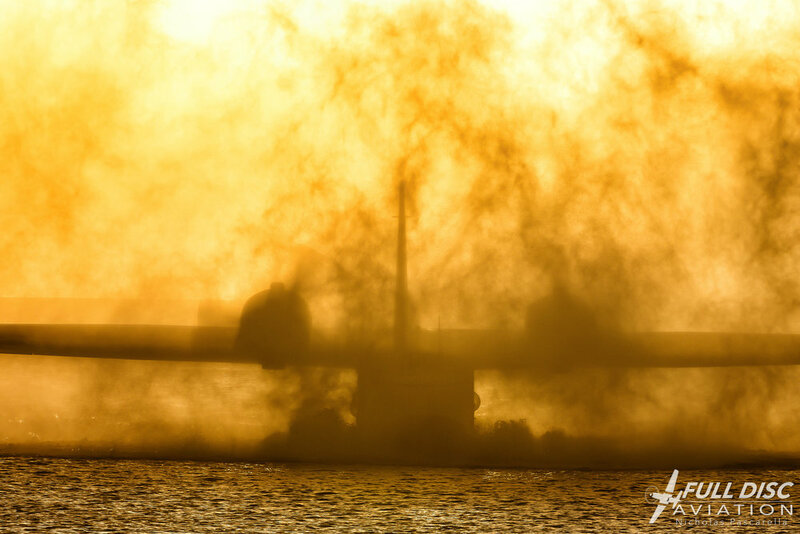 When they landed facing us the second time, the spray from the reverse-pitch props threw up a tremendous wall of water, obscuring the aircraft for a few moments in amazing orange light. The beach was buzzing with excitement. 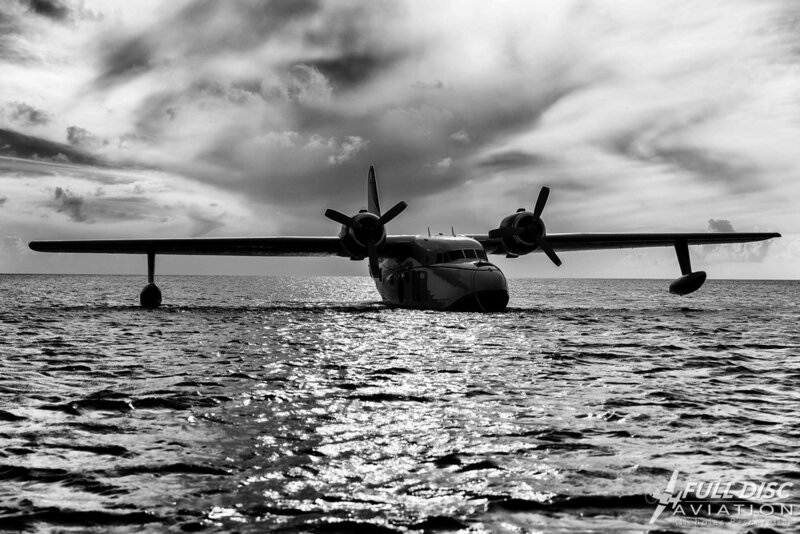 The aircraft taxied to shore and the pilots "beached" the Albatross and shut her down. The crew built a fire on the beach to film the pilots enjoying an campfire alongside the aircraft as the twilight faded and the stars poked holes in the night sky above us. The final flight from the Bahamas required a long takeoff roll away from shore as we were heavily loaded, but we finally broke contact with the water and climbed to a few thousand feet, where our only company was puffy clouds over the undulating blue sandscapes that are all similar but never quite the same. The wild estuaries and channels created watery gradients that are truly only appreciated from the air. This "fantasy machine" documentary promises to hold these treasures in high regard, giving artistic flair to the raw abilities of these incredible machines, and showcase them in a light never before seen. 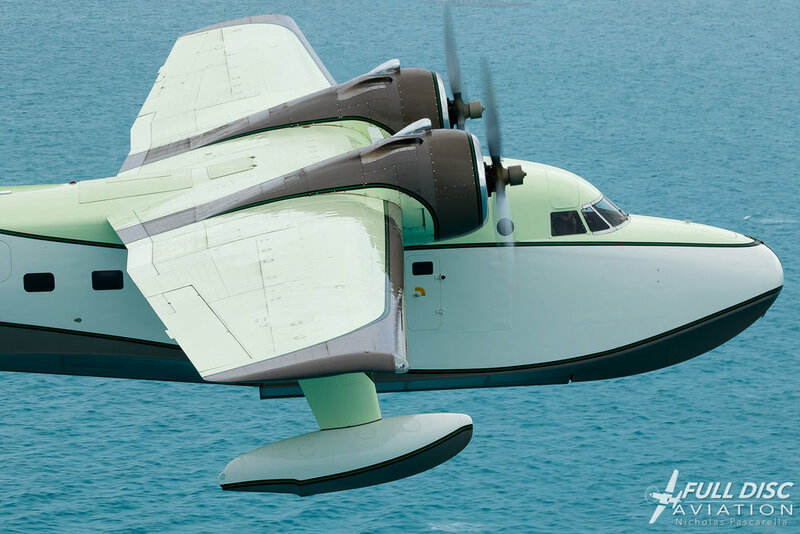 With production wrapping this year, it won't be long before Dirk's "Flying Boat" immortalizes these amazing aircraft through the majesty of film.